Spray paint artist Skip Colbert creates one-of-a-kind graffiti art onsite, customizing a unique design that is yours to keep and display. 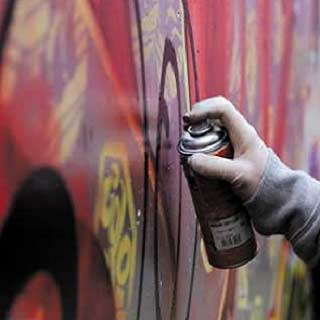 With Almost Legal Graffiti, spray paint artist Skip Colbert creates one-of-a-kind graffiti art onsite! For the custom spray painting, Skip uses two 4-ft. x 4-ft. boards hung side by side, creating a graffiti design across each board for one continuous piece of art. Help customize your own unique design – from school name to slogan, initials and/or logo – or Skip can graffiti two separate 4-ft. x 4-ft. paintings. The one-of-a-kind piece is yours to keep and display! Another airbrush artist will be on-hand, helping to encourage students to step up and try out their skills on two additional boards. All spray paint supplies are provided, including paint in a variety of colors, four 4-ft. x 4-ft. boards (each board has pre-installed grommets in each corner to hang the artwork) and drop cloths. The demonstration is best done outdoors, though with proper ventilation, can be done indoors as well (there is minimal over-spray so a few drop cloths will protect surrounding surfaces).